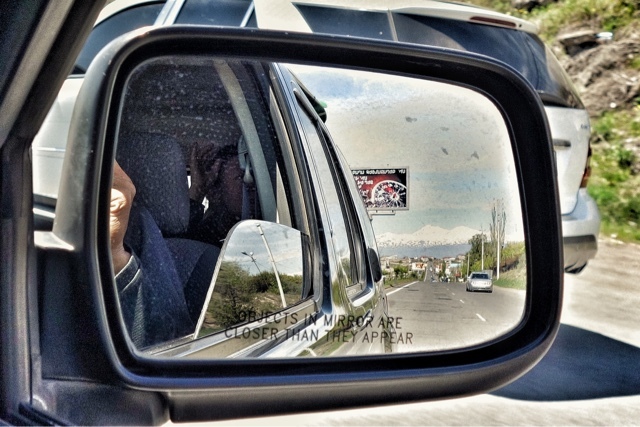 Armenia's Mount Aragats from the road to Pemzashen. The rocky North Summit, one of four peaks that surround the volcano's crater, is the highest. 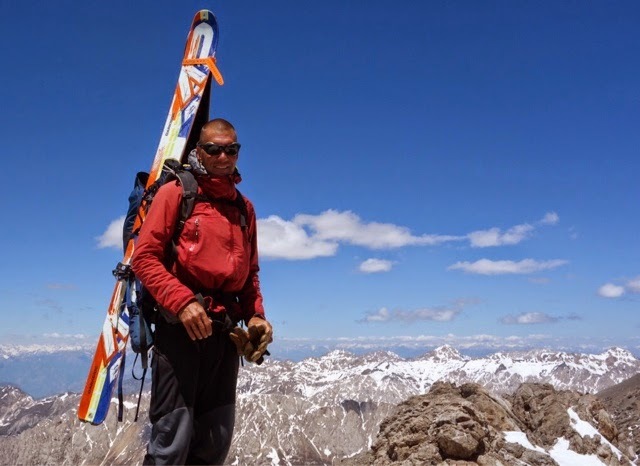 Hovhannes Martirosyan claims to be one of the only backcountry skiers in Armenia. And I think I believe him. On the sunny day we skied powder snow down the North Face of the North Peak, I'm sure we were the only souls skiing in the country. 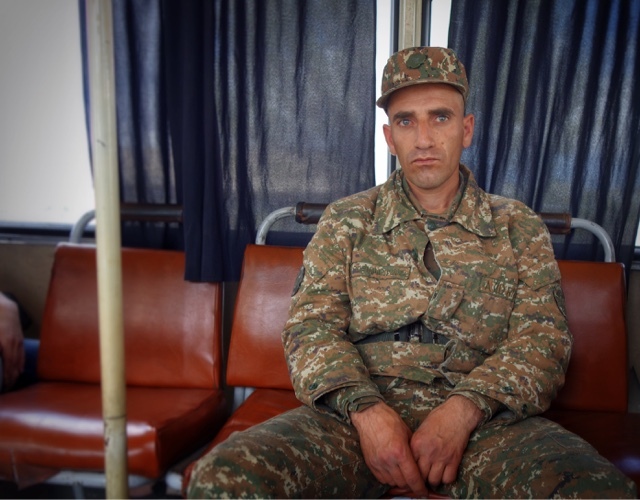 After a few days of internet research and spreading our good word around town, we found Hovhannes, and after watching his GoPro video of the Armenia ski dance down the mountain, we were convinced he was our man. Hovhannes and I with Turkey's Mt. Ararat in the distance. Day one skiing in Armenia. With warm, almost summer-like conditions in the capital city of Yerevan and a thin snow pack across Eastern Europe, our expectations were low. 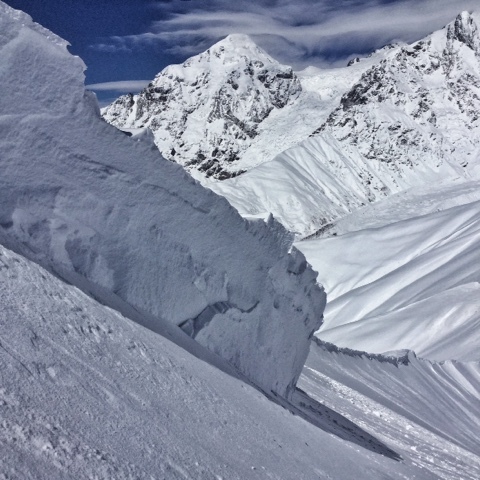 However, after spending a day skiing a few thousand feet of Lower Caucasus corn in Hovhannes' top-secret local stash, things were looking up in big way. Driving to Pemzashen in the late afternoon sun to stay with Hovhannes' parents for the night, we had our first real view of the North Summit and the the North Face. Expectations turned to high. 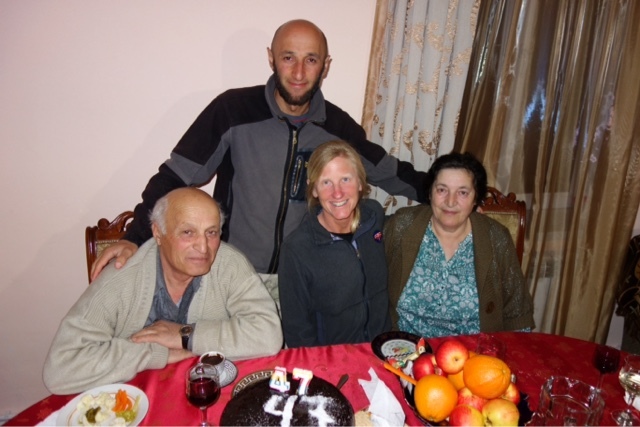 We celebrated Deb's birthday with Hovhannes' family the night before our alpine start for Aragats. We drove from Pemzashen early in the morning to a village 15km below the mountain where we were to meet a 4X4 rig to take us to snow line. 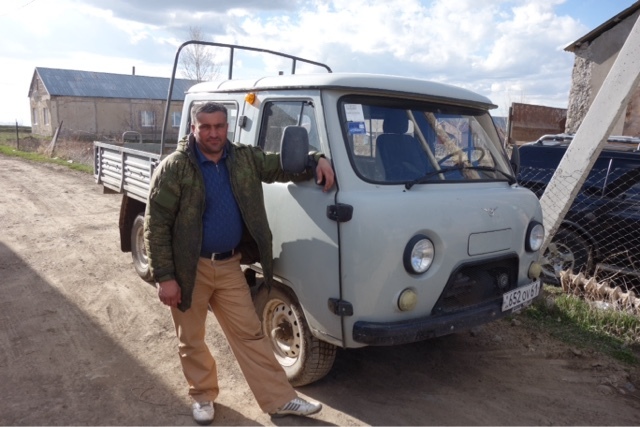 Hovhannes had called the mayor of the village the night before to set up the ride. If you are friends with this guy, you can go pretty much anywhere! At the summer sheep pastures just below snow, we started the 3,000 ft climb through the foothills and gorges that would access the steep slopes of the North Summit. Temperatures rose with each foot we gained and each hour that passed. 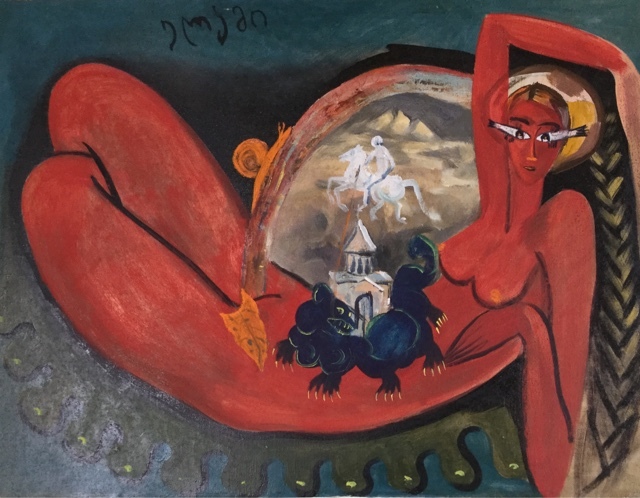 Hovhannes was soon stripped-bare chested which he would later pay for with a wicked sunburn. Miraculously, the snow on our chosen aspect was slowly turning to powder, and after 3,000 more feet of steeper climbing, we found ourselves booting up a stable 45 degree slope in knee deep Armenia cold smoke. 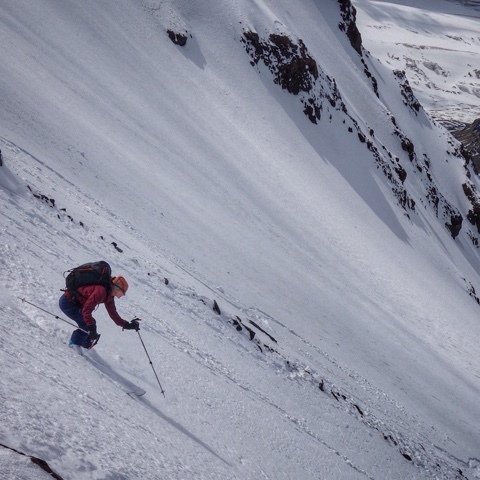 We passed a gigantic wind pillow, up a small couloir and reached the "Skier's Summit" about 800 feet below the rocky high point. We were here to ski, this was our top and we pointed our skis down. H on the boot pack. Deb turning down the steep slopes below the rocky summit. Regardless of high or low expectations, how can you not enjoy steep powder snow in the sunshine off Armenia's iconic high point? Down, down, down til our legs could take no more, then down some more and a shake of the head in awe and appreciation. Sun-sheltered snow in Aragats' many gorges allowed us to keep our skis on and turn for more than 6,000 feet with only brief sections of "dry skiing". We again met our 4X4 driver and after coffee with his family in town, we were parked in front of a huge Armenia dinner spread care of Hovhannes' mom. Turning, down, down and down. The end of a long, sick day. 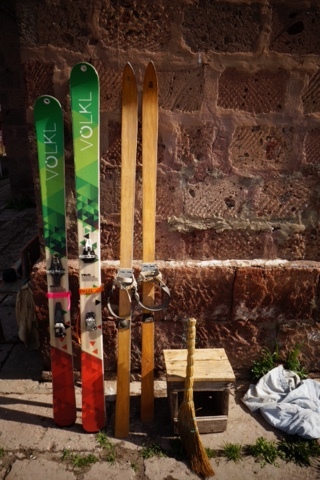 Our skis with Hovhannes' first pair. He has new ones now! Thanks Hovhannes and thank you Armenia! P.S. 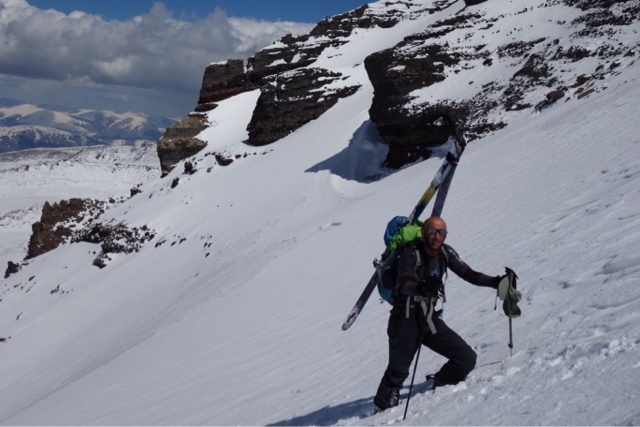 If you want to ski in Armenia, H is your man and we are happy to share his contact info. Just leave a comment below. 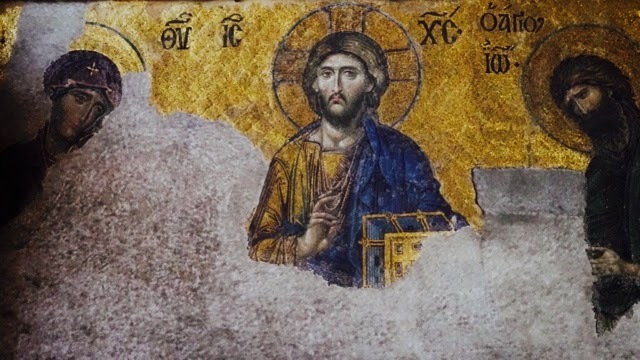 Onward to Bulgaria, but that's another story! Wish I were a better writer. Wish I could express the feelings of the last days skiing in Svaneti. Wish I could describe what it's like to sense the tears welling up in my eyes as I linked turns down the final run of a final day. Wish I could tell you of the fear I felt as electricity pulsed through the air, through my metal ski pole, then through my arm as we escaped down a ridgeline ski in a freak lightning storm days before. 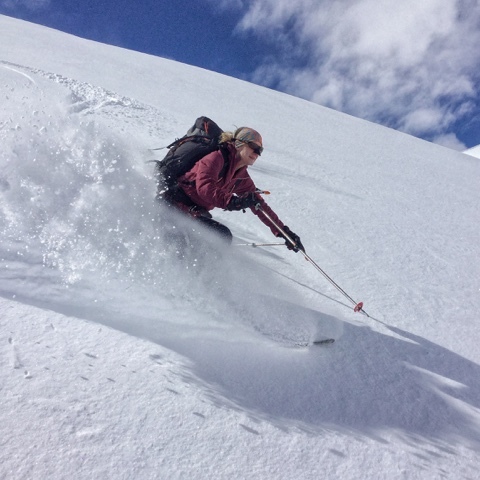 I wish I could take a photograph of the emotions I felt standing, watching as Deb arced perfect turns, singing her "Powder River" song, through thousands of feet of sunshine snow. All this and more . . . Good bye Ushguli. What will go down in history as The Four Days War broke out days before our travel to Armenia. 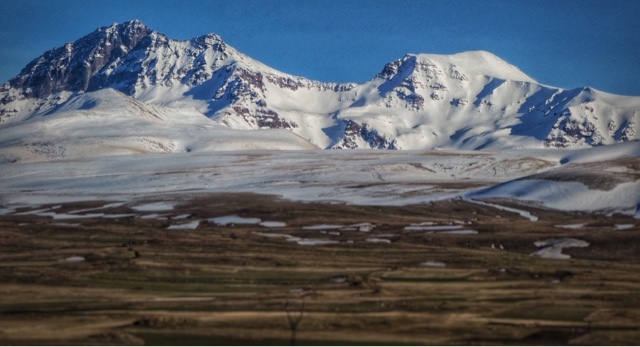 A geo-political chess match in the disputed Nagorno-Karabagh state along the Armenia/Azerbijiani border threatened to quash our dream of skiing on Armenia's highest peak- the volcano called Aragats. 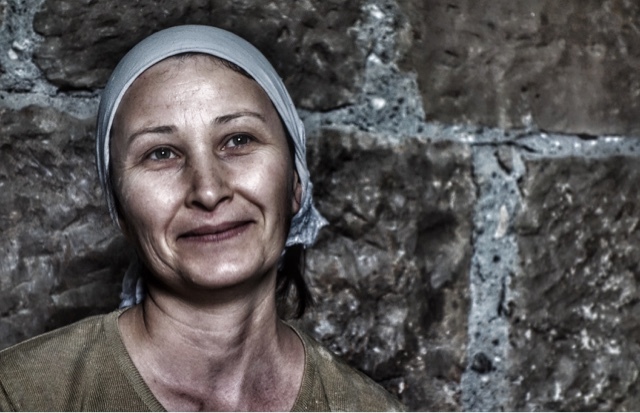 Despite warnings from the U.S. Department of State, all our inside information told us we would find peace in and around Yerevan, the capital city and the lands surrounding Aragats. And peace we found. Out the window view of the mountains as we head into Yerevan. 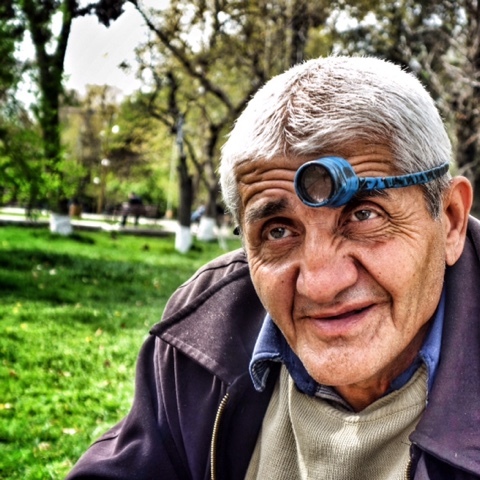 You can get your watch fixed by this man in the Central Park of the capital. 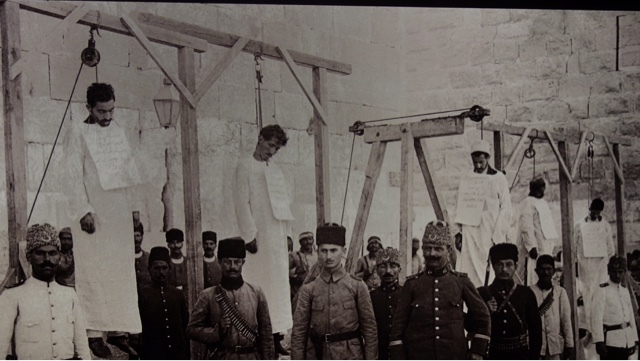 One of many difficult and disturbing images from The Armenian Genocide Memorial. As we walked past the bakery in Echmiadzen, we were called in, serenaded by the baker and given free bread. I took this photo from above the hot, smokey wood fired oven. We spent a few days in the capital organizing our ski trip, visiting some nearby churches and monasteries, and trying unsuccessfully to blend in in an amazingly hip and cosmopolitan city. I was the tallest among the sea of black shorn heads, Deb was certainly the blondest and our ski bum travel clothes felt like rags compared to the chic dress of the locals. Checking out city life is always an adventure for me and I often feel like I could spend endless days wandering, drinking coffee in cafes and people watching. 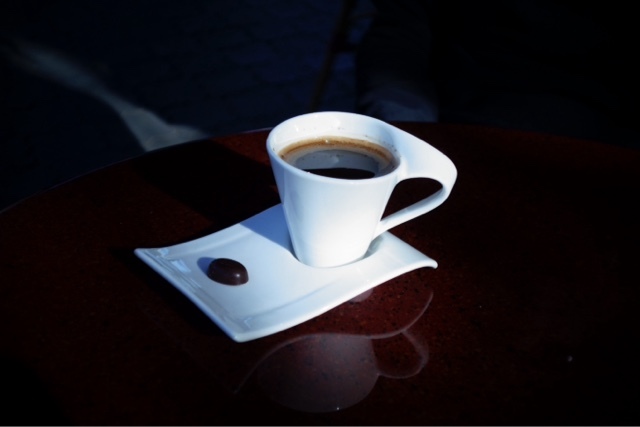 An Armenian coffee in the central city. My palette is not refined enough to tell the difference between Turkish, Greek or Armenian coffee, but don't tell that to the proud locals! 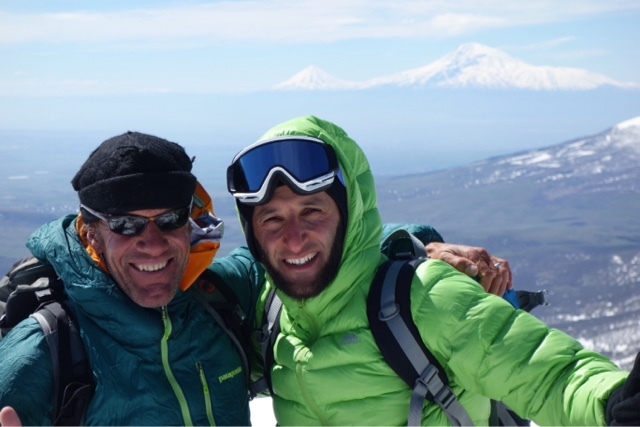 After being shut down on Mount Ararat last year in Turkey, due to cloudy hail storms, we watched and waited for our weather window to ski Mount Aragats in Armenia. We surfed the Norwegian weather website yr.no constantly for days, hoping that we would get a gift of sunshine that would coincide with Deb's birthday on April 17th. On the bus home from Echmiadzen. 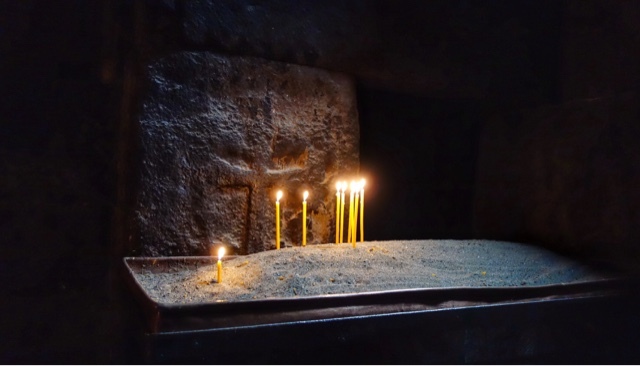 Lighted candles send prayers in one of the oldest Christian churches in the world. The Geghard Monastery 9 km from the the town of Garni. We found our window, found our man, Hovhannes and we're ready for Aragats. This is what I know and with barriers well beyond language, it is hard to foresee a breakthrough. We spent 10 days here at the home of Temaraz Nijaradze last winter. 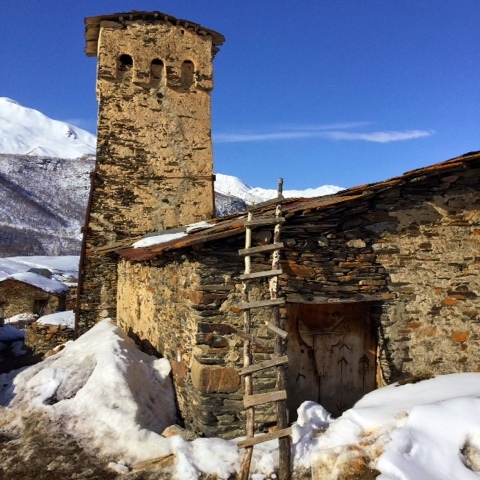 We will be here this year for almost three weeks, eating his lovely and ever-cheerful wife Leila's delicious kubdauri, khachapuri and lobianni (and of course drinking cha-cha), while enjoying their hospitality before and after our daily forays into the mountains to ski. Brother Fridon lives here as well, in a sense. A closer look reveals a separate reality. From Temaraz, who speaks Svanish, Georgian, Russian, a little German and almost no English, I've learned these few facts. 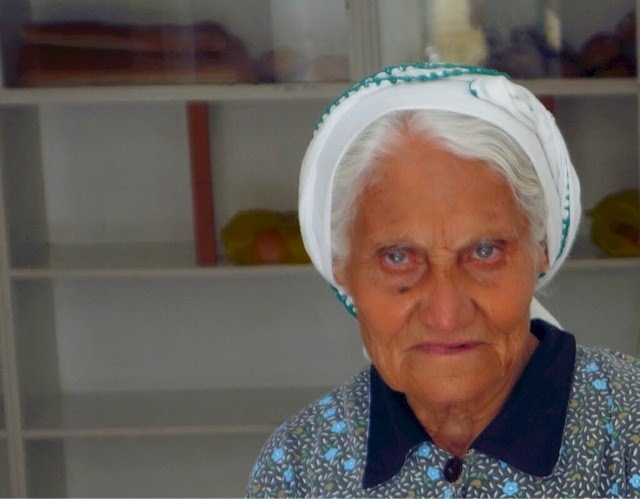 Fridon was born in 1944 in Svaneti- he is 72 years old now. 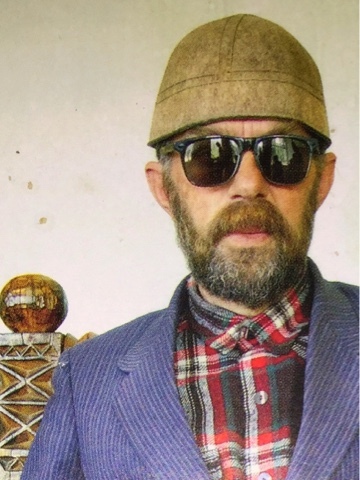 He's been an artist and craftsman all his life. 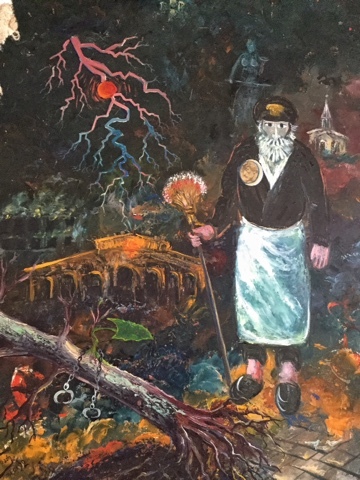 After a spell in the Russian military in the 80's in what was then the Soviet state of Kazakstan and a spell in a Soviet mental hospital he returned to Ushguli. 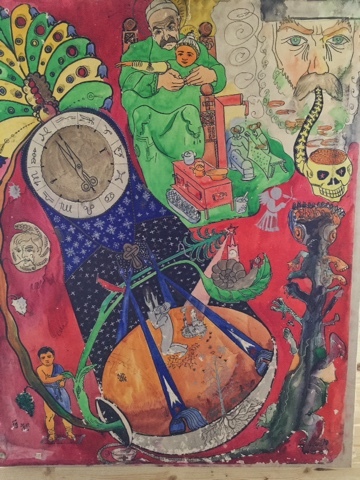 Pridon's work is not unknown to the outside world. There have been magazine articles, short films and profiles written. 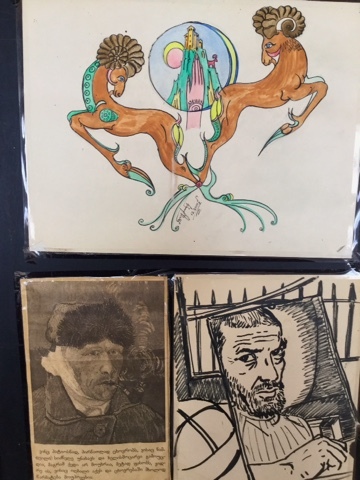 Though his art has not been shown outside the small "gallery" in the room adjacent to our guest room. His time in the hospital, which I can only guess included electro-shock therapy and heavy doses of lithium (again, this is only my guess)- has left him shielded behind an almost impenetrable shell. I write "almost" because I believe he has shone me some light. Mornings, after doing his exercises - 10 push-ups, 10 deep knee bends and few minutes with a hand strengthening tool, are when he is most lucid. No sentences for me, only words. Sometimes Russian, sometimes German, sometimes English. "Cosmos! Apocalyptico! Einstein!" And sometime a smile. After breakfast the ziplock bag of medicine comes out and used and empty syringes appear. Then a cigarette. Pridon is fascinated with the picture I carry of the Dalai Lama as a child on my iPhone. "Dalai Lama! 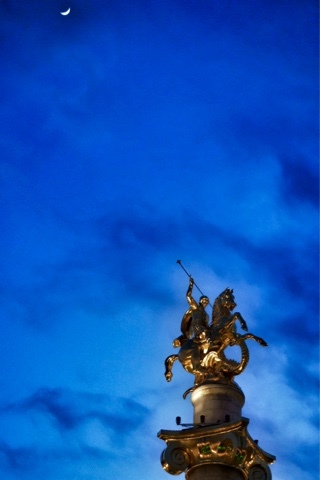 Tibet! Revolution!" Not so, other photos. When I tried to show off my captures from a day of skiing he only shakes his head and points to the sky. "Only interest Cosmos!" Heading out of town for a day of skiing. We are living in the upper most village of four total in Ushguli- Zhibiani. This is the lowest village, called Murqmeli. At present, there are two families living in Murqmeli, twelve in Zhibiani. Behind Temuraz's tower is this abandoned truck left over from the days of the former Soviet Union. Temeraz says the engines were very good. The body not so much after apparently having been tumbled downhill. Temuraz's tower seen from the neighbors stone barn. 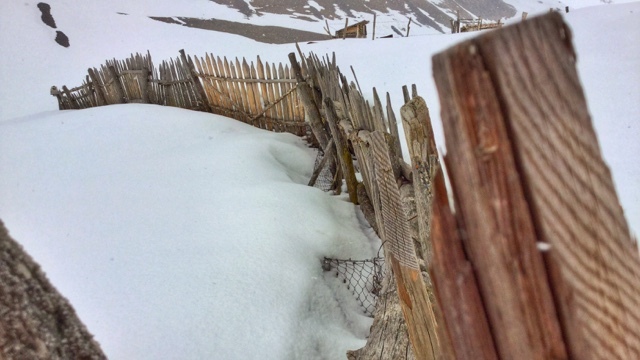 Winters' snow and wind necessitate constant fence mending with whatever materials are at hand. 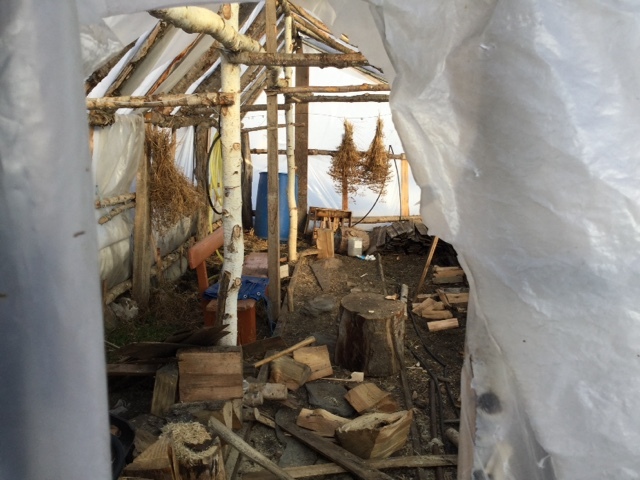 Herb drying and wood splitting chores happen inside the old greenhouse. 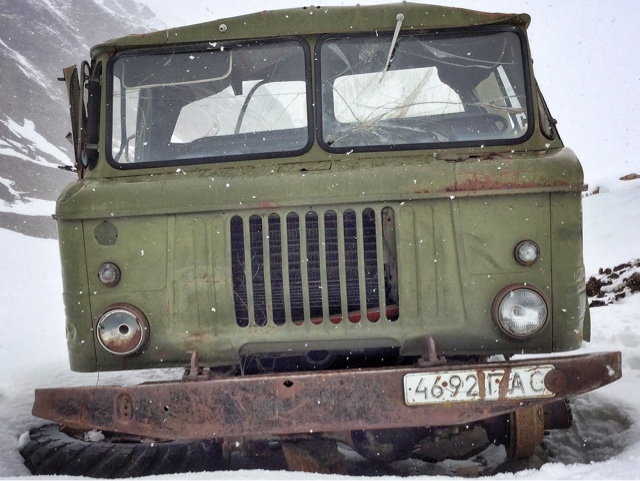 Another abandoned Soviet era vehicle behind the St. George church in upper Ushguli. The Shkhara complex stands in the distance. Not OSHA approved. A ladder to access the metal roof above the cow barn. Leila comes out every morning for milking and we have fresh cream for our coffee, yoghurt for breakfast and hot cheese to cover the rest! 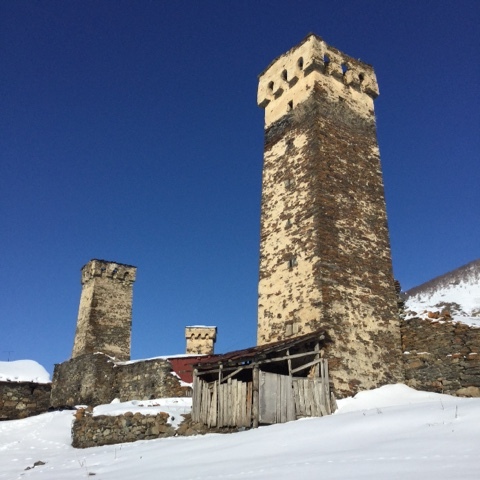 Svaneti towers on a blue background in Ushguli, Republic of Georgia. To be clear from the start- No, the avalance did not sweep us 1,000 meters down to our death. And yes, I feel good about our terrain choices that day. And yes again, the skiing was incredible. 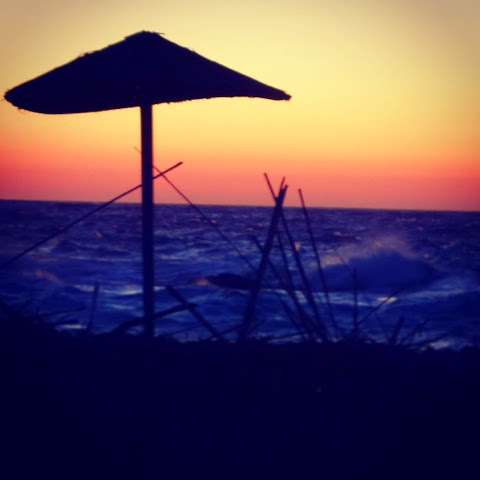 We took a year long hiatus from writing about our travels, but that does not mean we were idle. Last Spring found us skiing and adventuring over far Eastern Europe and far Western Asia from the Caucasus Mountains of Georgia to the volcanoes and biblical legends of Mount Ararat in Turkey. A lot has changed in this part of the world politically. Changed very quickly and is fluid just as I write. However, we trust in the basic goodness of people and have chosen to return this year to venture a bit deeper. We will probably skip the crowded tourist markets of Istanbul and sadly miss the rich culture and welcoming people of Kurdistan. 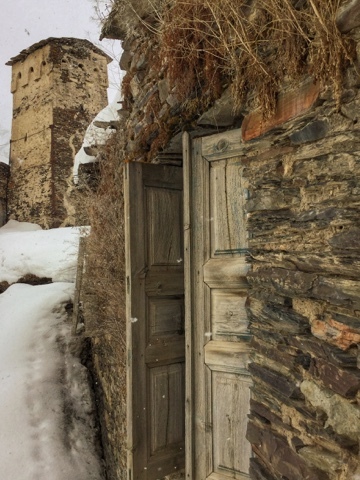 30-plus hours of travel, a few days of jet-lag decompression in Tblisi and a long, rugged x-country drive to the Svaneti region of North Western Georgia found us finally in the snowy town of Mestia. 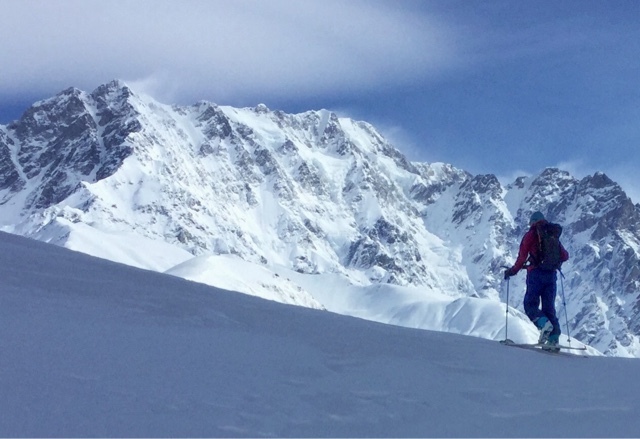 We skied every day for five days and had only the rare glimpse of the Caucasus mountains that we knew were towering above. The skiers among you who are reading this will understand the fun we had navigating ups and downs inside a cream-filled ping pong ball. Ushba rises from the clouds. A day after our first brush with death hitch-hiking down from Hatsvali in the back of poorly shod pickup truck we took another full day to travel the 40k dirt road over Ughviri Pass to, literally, the end of the road in the mountain village of Ushguli at the foot of mighty Shkhara Mountain. Shkhara defines Georgia's border with Russia and is her highest point at 5,203 meters. Deb skins up just outside Ushguli village with the Shkhara mastiff above. After two days of windy winter storms and zero visibility the clouds broke and we were given a gift of alpine high pressure sunshine. And we took advantage. Snow scientists know that heuristic traps are at their widest during the first sunny day after a storm. We jumped right in. 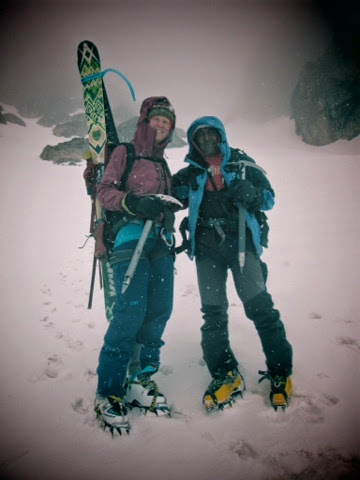 As we toured up through the valley and and onto the ridgeline that led to our first 3,000 meter peak both Deb and I anticipated powdery bliss. 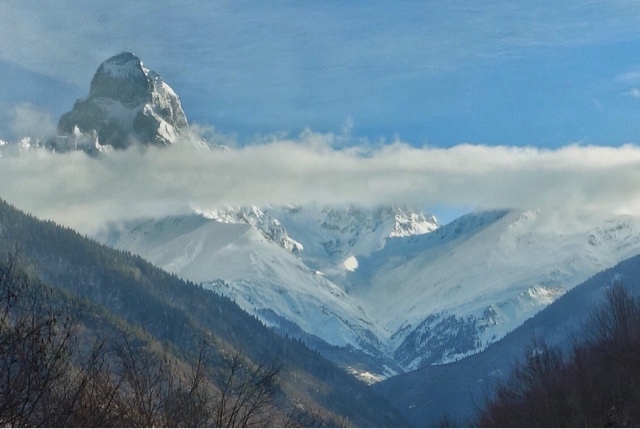 We talked about how the day was once again the culmination of both our history of alpine travel together and of this particular persevered journey. Following the ridge upward with ever tightening switch-backs we found ourselves perched 10 meters below the summit. 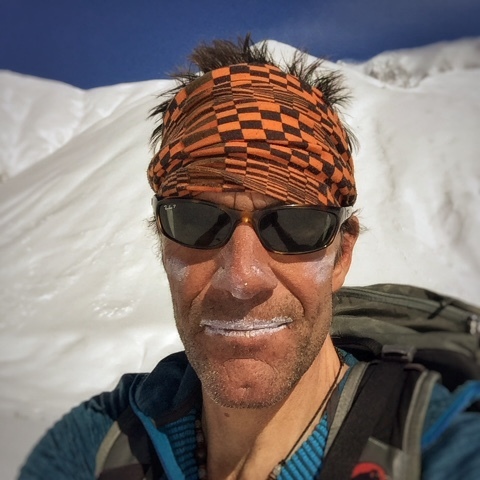 In the windless sunshine we discuss transitioning to booting for the final push in order to keep to the ridge proper and limit our exposure to the two 3,000ft avalance paths that we straddled. Whoomph! The sound that skiers dread signaled the slides we triggered. 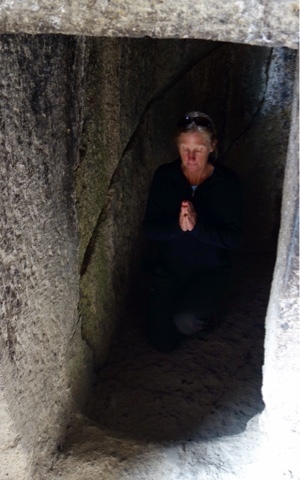 I was knocked from my feet and somersaulted twice down towards Deb as she stood still amongst refrigerator-sized soft slab blocks. As I lay at her feet we watched in awe as tens of thousands of tons of snow avalance down on both sides of our now seemingly tiny perch. To the East the slides crown was 10 feet deep, to the West 8 feet. At the weak point where I had stood moments before the crown line was a mere 2 inches- just enough snow to gently tumble me over. Dave Brown, my Luddite ski partner and friend- I know you will probably never read this internet blather, but I know what you would say. "It's good to go now!" We booted up the icy final steps to the summit and collected ourselves. Deb boots the last steps to the summit. You can see our still intact skin track on the ridge below with debris on either side, 3,000 ft below. I don't want to sound too dramatic, but, as another friend said after hearing of our brush with the dragon, "Sometimes very small decisions can make the difference between life and death." We slid gently down - where else was there to go? And skied soft and beautiful North facing powder in the sunshine. I will leave it to the armchair quarterbacks to judge our decisions as the power on my tiny keyboard is running out and the electricity here in Ushguli for a recharge is unreliable at best. I was born in 1964, Deb during the "Summer of Love" '69 - teenagers during the early 80's. I thought I missed this hippie dream life. Hitch-hiking through the hills, living on bread, tomatoes and salt, playing naked in the sea, sleeping on the beach. 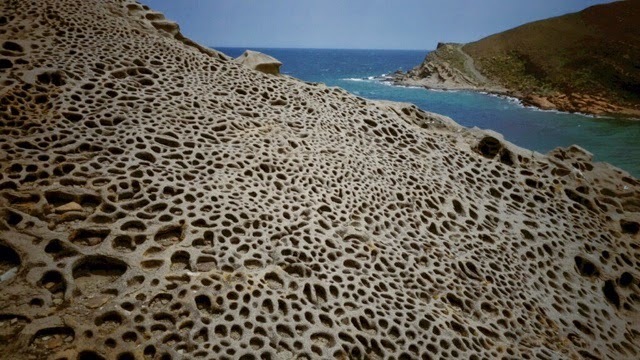 . . Happily, the islands of the Icarian Sea are still here, and I was wrong. 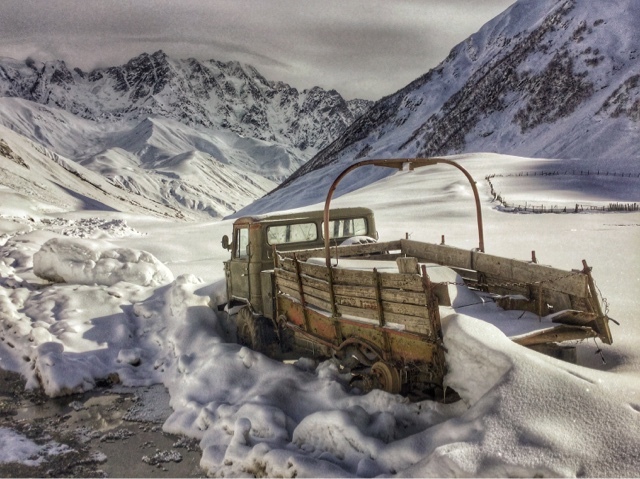 We were last seen in Winterspring, Kyrgyzstan, headed for Khorog, Tajikistan, close by the Afgan border. With hard-won Tajik visas in hand and a car booked for early morning departure from Osh, we were primed. Drug related violence in Khorog had us a little worried about our destination, but when our driver refused to cross the road blocks in the Kyrgyz village of Sary Mogul, still 50K from the border, for fear for his own safety, we were done. Once again, as has been the theme of our travels, it was time to listen to the Gods and take full advantage of our adaptability. We booked the next flight to Istanbul and switched mountains for the Sea. Switched mountains for Sea, Muslim for Christian. We knew we'd crossed from East to West, Asia to Europe, Muslim to Christian when the swim attire changed from orange one-piece "swim burkas" complete with tie down head scarf hoods for the surf, to nothing at all. 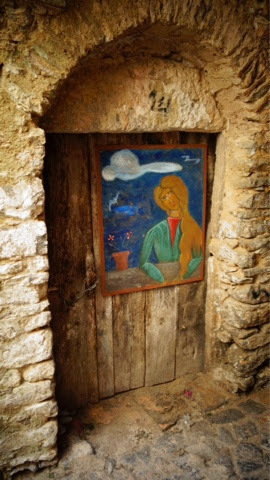 We embraced the naturalist ethic fully as we moved from Gokceada and Bozcaada in the Turkish North Aegean to the Ikarian Sea and Greece. Blue eyes and olive skin, Classic Hellas. We hopped South from island to island, one unique paradise to the next. We swam through caves that may have held a cyclops, jumped naked from high cliffs and ate octopus on our wedding anniversary. Not much to report here. Our days were filled with swims in aquamarine sea, trail runs across the goat paths and of course tomatoes, olives and fresh feta cheese. A "vacation from our vacation" we liked to say. 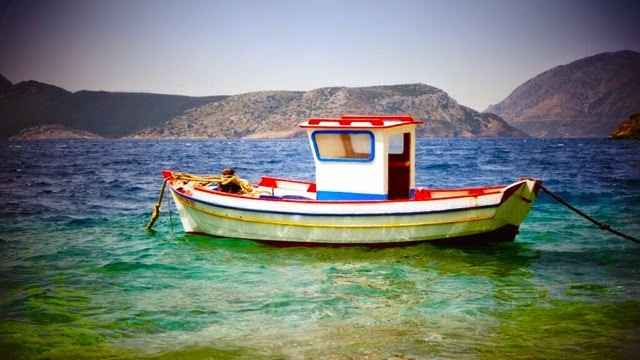 Our plan was a quick return to Turkey to explore the highland mountains and make our way slowly North to the Black Sea, but we fell in love with the beauty and pace of the Greek Islands. And to be honest, we were tired of moving like sharks through our travels and needed to slow down and even stop. On tiny Lipsos Island we found our home and it there we stayed until the time warp collapsed and we zoomed- ferry, bus, ferry, train to Istanbul watching this amazing trip come to an end before our eyes. There was time in Istanbul for one last adventure, one more miracle, one last present during the best and longest lasting birthday party ever. Those of you who've known me forever, yes that's you Woody, Creature . . . you know who you are, will understand that it was Destiny that brought Neil Young to play outside in Kükçükr Park for the last night of our travels. My My, Hey Hey. As I type on my tiny iPad keyboard one last time here on the airplane headed home, I know that it's too soon to try put together all the pieces of this trip in my head let alone on a computer screen. One last photo speaks a thousand words. Blue skies in the Babash Ata Range. We were married high in the Andes Range in Peru, with the mountains as our witness. Deb will tell you I tricked her into it while she was in a weakened state of high altitude craziness, but that's just not true. We learned then to trust and listen to the mountains. 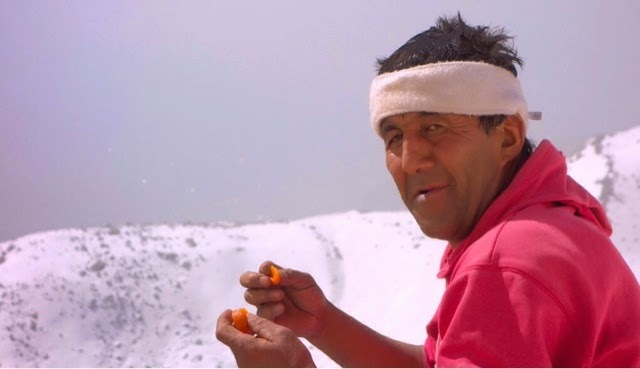 We stared at the steep and rocky slopes of Babash Ata from Arslanbob all winter, and could only dream of what the hidden North facing aspects held when stable springtime conditions might allow us access. We also dreamed of a first ski descent of this noble mountain. With our friend Fazil as our guide, we set off on horseback with five days of food and packs laden with ski and climbing gear. 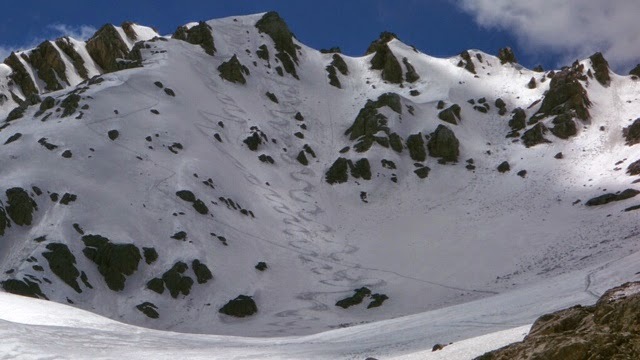 We left the horses at the snow line, and after two days touring up and over the range, we set basecamp beside a still frozen glacial lake beneath the fantastic couloirs that rose to the summit of Babash Ata. 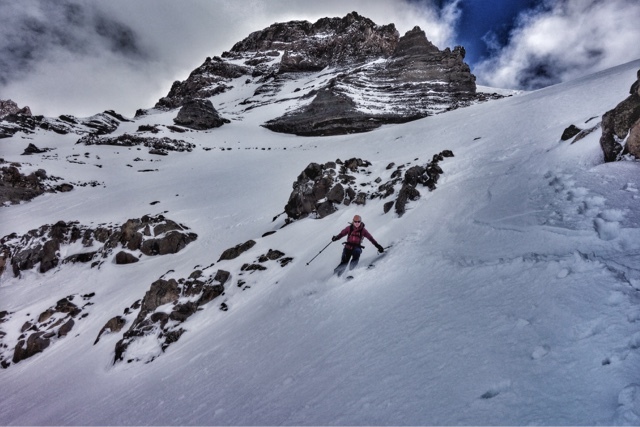 We slept restlessly in the cold night in anticipation of another perfect day climbing styrofoam-like snow up and skiing corn snow down during our first descent. Once again, however, the mountain Gods had other plans. After coffee and oatmeal, (yes, even Fazil the diehard Uzbek chai drinker joined us for some instant black magic) we headed up into thin clouds that looked like they might give us passage. 200m from the summit with 40 minutes of climbing to go, the snow began to rage and it was time to listen to the mountains. Babash Ata said "No". Turnaround time as the clouds smack down. The storm raged on for two days and two nights with Deb and I snuggled up in our cozy tent and Fazil somehow happily surviving in his plastic wrap burrito bivy system. I will say this only once so I don't offend - Fazil is one tough F#€^er! We took advantage of the brief pauses in the storm to shovel out the tent, drink a bit of chai and wolf down some naan. 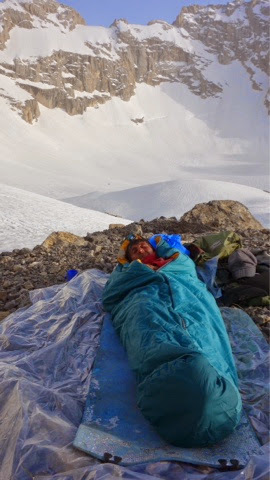 During the long windy nights as the snow sifted up under our vestibule and dusted our faces as we slept, I lay wondering if the muffled sounds I heard from Fazil's burrito were snoring, singing or praying. Fazil emerges from his cocoon as the storm breaks. On the fifth day we made our escape, vowing to never camp again. 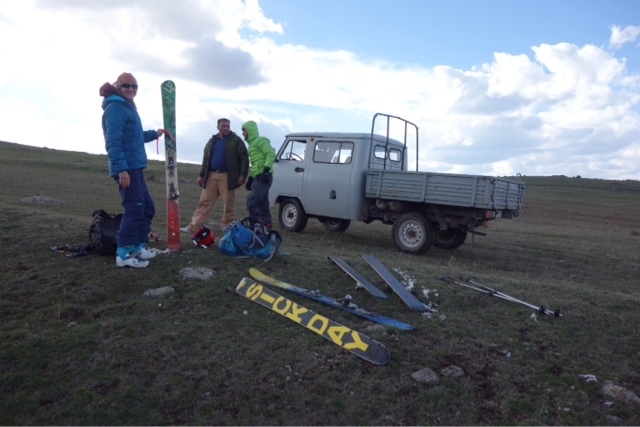 Of course after beer, vodka and plov with Hayat that night in summer-like Arslanbob we'd hatched a plan for horses and first ski descents above Friendship Pass. 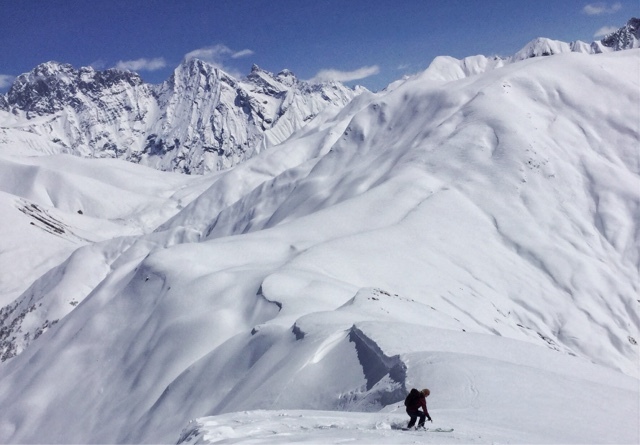 For our adventurous friends, a first ski descent of the gem of the Babash Ata range is there for the taking if Hayat does not get there before you! The consolation prize- first turns down the mountain we will call Lugge Apa, the mother of the skiers. Deb cruises through wet corn down Friendship Pass towards camp. 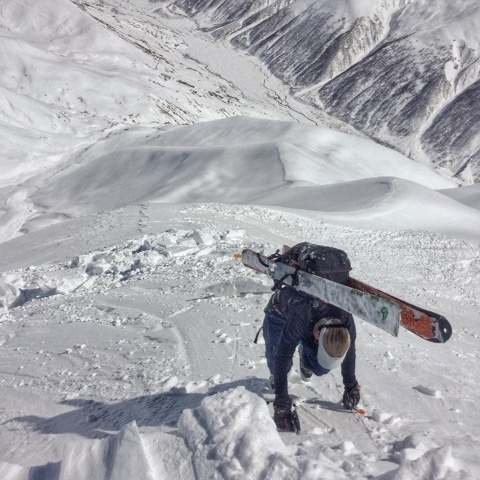 We'll leave our skis behind again tonight as we head South towards Tajikistan and more adventures.